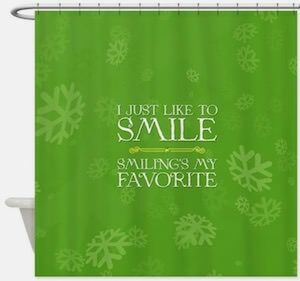 Now you can be all clean for Christmas all thanks to this Elf I Just Like To Smile Shower Curtain. The Elf shower curtain is green and measures 69 x 70 inches and has 12 enforced eyelets for your shower hooks. And this curtain is made from 100% polyester and is machine washable to keep it nice and clean. On the green shower curtain you can see some snowflakes that are also green and then there is one of Buddy Elf’s famous line from the movie “I Just Like To Smile, Smiling’s My Favorite”. So now every day you start your day taking a shower you are remembered about smiling and that can make your day a little bit better. ” Santa! Oh My God! Santa’s Coming! I Know Him! I Know Him! “. For all of us Elf fans this quote is unmistakable so why not put it on a dress. This is an all red dress that features multiple images in a pattern all over the dress. 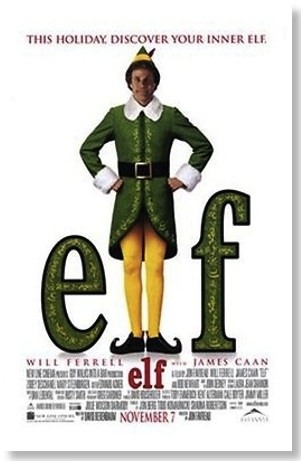 The images are of the popular character Elf played by Will Ferrell right at the point where he is so excited to find out that Santa is coming. Available in a wide selection of sizes that range from XS to 2XL, this is an A Line dress which has a loose fit to flow and will be super comfortable to wear for this holiday season and Christmas. Elf is a classic holiday movie and now there is this Buddy Elf Santa I Know Him Christmas Sweater that is perfect to wear when you watch it. 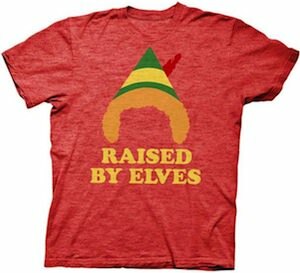 The Elf Christmas sweater is made to fit both men and women and comes in sizes Small – 4XL and they are made from 60% cotton and 40% acrylic. The Christmas sweater is white with red around the shoulder and the bottom and on the whole sweater you can find snowflakes. 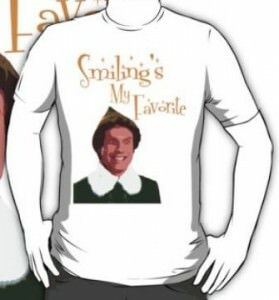 The front also has a big picture of Buddy Elf and next to him in big letters the text “Santa I Know Him”. 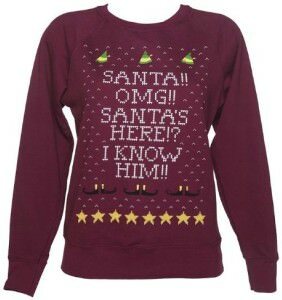 Elf is the holiday movie I really like and if you like it too the show the world by wearing this sweater. This is the time for food and now you can eat from this Elf lunch box. Elf the movie is so part of Christmas that now you can have your Christmas lunch out of this amazing lunch box. 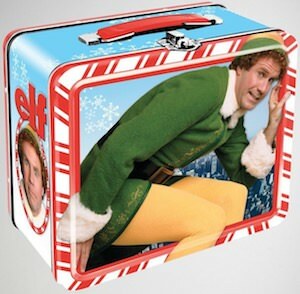 The metal lunch box shows Buddy Elf in a bit picture on the front almost like he tries to fit inside the lunch box and even on the side you can find Buddy and it says “Elf” on it too. Besides for lunch, this Elf box is great for storing small things too so that you could store special Christmas items inside it so that they never get lost again. 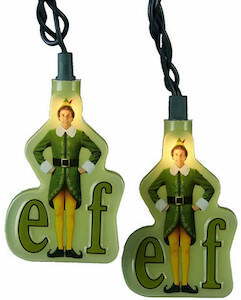 If you like the Christmas movie Elf then you just need this Buddy Elf figurine. The figurine is part of the Pop! 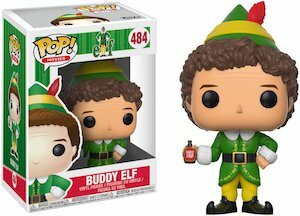 series from Funko and Bussy is number 484 in the series. 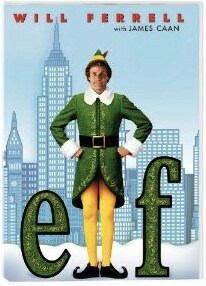 Buddy Elf looks like you expect with his funny hat and his curly hair and his Elf costume. The Buddy figurine is 3 3/4 inches tall making it the perfect size for next to the Christmas tree and if you like to keep him look new for years to come then you should keep him in his cool windowed box so that you can still look at him while he stays new. Now there is a Buddy Elf Christmas sticker and that means that you can decorate almost anything just by adding a sticker. 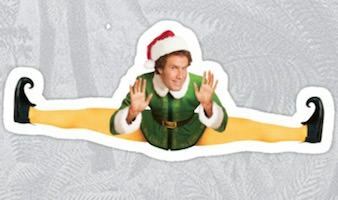 The Elf movie by now is a Christmas classic and the funny elf from that movie can now be part of your life because this is a die cut sticker that shows Elf in his typical outfit but now he also is wearing a red Santa hat. And Buddy is pretty flexible as it, you can see he is doing the splits making this a really wide sticker. And this vinyl sticker is great for on almost anything so that you can stick it on your car, fridge, books and more and after Christmas, it is pretty easy to remove it from hard surfaces so that you are ready for the next holiday. 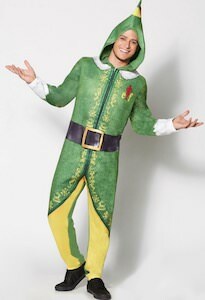 If Elf is your favorite Christmas movie then this Elf onesie costume pajama is what you need. The costume pajama is unisex and it will look stunning on both men and women and it is available in many sizes. The onesie pajama looks really like you are Buddy Elf complete with a fun hood and the Elf movie logo on the front. A onesie pajama like this is great for sleeping but would work perfectly as a Halloween costume too and even for the Christmas party at work. 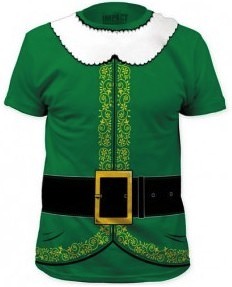 So feel like Buddy ELf by wearing this cool costume pajama and I guess that also allows you to eat lots of candy. 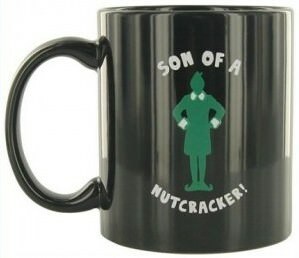 If Elf is your favorite Christmas movie then you should check out this Christmas stocking. 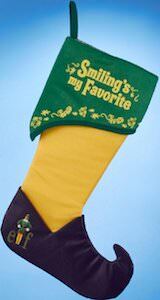 The stocking looks a big like it is part of an Elf with the black shoes yellow tights and a green top. And on the foot part, the Christmas stocking has the logo of the Elf movie which includes a picture of Buddy Elf and on the green top you can see his favorite quote saying “Smiling’s my Favorite”. The Elf stocking is 16 inches long and 11 inches wide and has a hang tab so that it can be placed with all the other Christmas stockings. Are you looking for a classic ugly Christmas sweater for your next work function or holiday party? 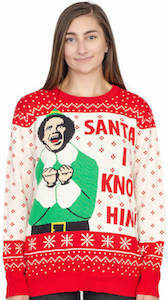 Have a look at this sweater that features a saying from the movie Elf where Will Ferrell plays Buddy the elf. After some time away from Santa Buddy the elf runs into him and screams out “Santa!! OMG!! Santa’s Here!? I Know Him!!”. Along with this classic saying you see multiple elf hats and shoes aswell as dots and stars that all create a pattern that looks like your next ugly Christmas sweater that is all burgundy in color. 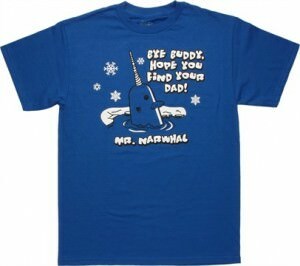 Made to be the best of both worlds durable and comfortable from a great blend of 80% cotton and 20% polyester. 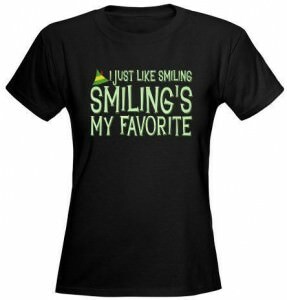 Available in a wide selection of women’s sizes that range from Small to XL. 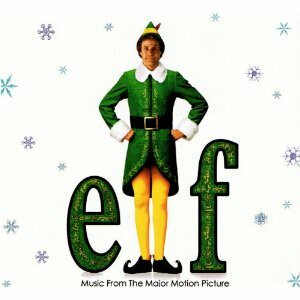 Elf is one of those Christmas movies everyone loves and Buddy Elf is just so friendly and cheerful that he can make almost anyone smile. And now Elf wants to be part of you Christmas with this fun throw pillow. 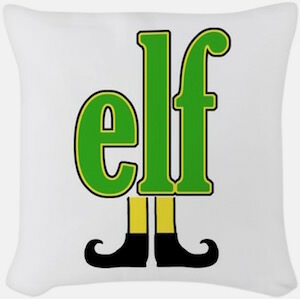 The white pillow shows the word “elf” with below it the legs and feet of Buddy making it look like a real logo of the Elf movie. The Elf pillow is square and each side measures 14.25 inch. Maybe this is not a pillow for year round but it is the perfect way to decorate that couch or chair for Christmas.